This article is part 3 of our Islands of Agricultural Innovation Series that brings Jacob Eisenberg’s detailed accounts of Asia’s indoor farming landscape to Agritecture readers far and wide. You can read part 1 of this series here, which sets the stage for Jacob’s trip and gives an overview of his journey, and part 2 of the series here: Japan. JACOB - Singapore is stop number two on my journey. Like Japan, it is an economic powerhouse. And on this tiny island nation, food is cheap, while land, space and labor are not. There are a number of reasons I have tried to outline as to why indoor agriculture is starting to take root here. But what I am most curious to learn about is the consistent challenges between direct government support for agricultural innovation and the reality for farmers and business vying to get started. Singapore is one of the wealthiest countries per capita on the planet. Despite its small size, it has a per capita GDP of around 486 billion dollars, almost twice that of Finland. It is an island geographically blessed at the center of the global shipping trade making its imported food supply cheap, but constantly threatened by climate change and geopolitical uncertainties. Though convenient, importing 90% of food has many concerned. 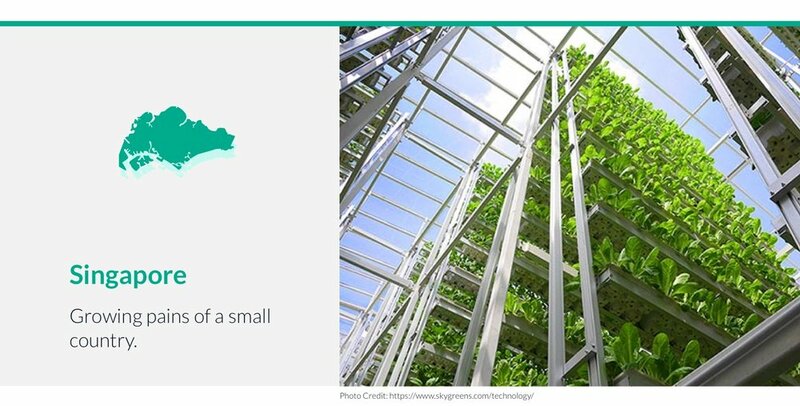 Many Singaporeans, including the Government, believe that Indoor agricultural technologies could be one solution in the transformation of their food system to a more self-reliant production system. The global food crisis in 2007 led to a nearly 12 per cent increase in prices for Singapore’s food imports. Some consider this to be the reason for such drastic changes in the Government’s recent policies on agriculture — namely, giving urgency to develop Singapore’s self-sufficiency in local food production to prevent future supply shocks. Before it was a global trade hub, Singapore was an agricultural hub at the corner of the British Empire. At the time of independence in 1965, Singapore produced 60 per cent of its own vegetable demand, 80 percent of poultry, 100 percent of eggs and even exported pork to neighboring regions. More than 50 years later, Singapore is better known for its impeccably clean streets and crystal skyscrapers rather than its pork production. It’s a tough competition for space on this island, and according to Savills, with more than $2,000 a square foot, kale cultivation can’t compete with a 40 story financial center. Despite the economics, Singapore still has a vibrant farm culture on the periphery. Farmers remain acutely aware of the need to innovate and change their business models to remain relevant and viable in a city-state where land and labor is expensive. Looking to other countries such as the Netherlands, Japan and Australia, Singaporean farmers found that small farms at the fringes of cities, also known as peri-urban farms, made use of their proximity to urban populations by offering goods, services and experiences beyond primary production. Creating education centers, museums, cafes and farm-stays on their premises providing enhancement and preservation of farms, while making the region a lifestyle destination for food culture. But marginal innovation doesn’t mean that all farmers are able to adopt these disruptive technologies. On the contrary, many indoor agricultural technologies and operations haven’t developed due to underlying business factors. High risks, lack of financing and limited and strictly controlled farm tenures seem to stifle adoption and ability to innovate. Stay tuned in the coming weeks for part 4 of Islands of Agricultural Innovation: Taiwan.